It’s almost summer, which for me, means my family reunion is right around the corner! I love spending time with my family & I love looking at pictures from past family reunions. 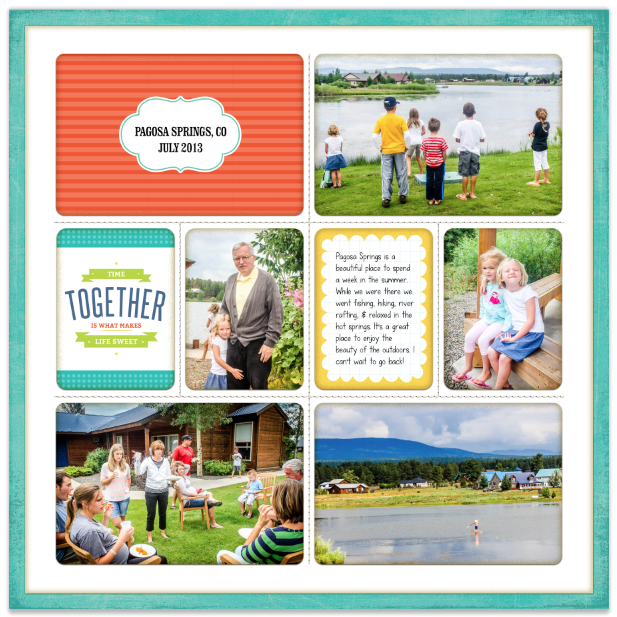 Today’s layout is the start of several pages I’m putting together from last year’s reunion which took place in Pagosa Springs, Colorado. It is one of the prettiest areas in the country! You’re surrounded by mountains, rivers, & lakes. And downtown is home to the largest and deepest Hot Springs in the world! I found some interesting history on the hot springs that I thought would be fun to include in this post. If you’re not really into history, then just enjoy today’s layout which features my new “Project Life Aqua Core Kit” that I created for Becky Higgins! I’ve been told the digital kit should be available for purchase in the fall, so you’ll have to wait a little longer for that. In the meantime, you can find the paper edition in Hobby Lobby & it should show up in Beck’y online store this summer. You can read more info about it HERE. “Pagosa Springs has the largest and deepest Hot Springs on the face of the planet. The Ute term “Pagosah” means “Healing Waters,” but it has been suggested by a native Ute elder that a more accurate term would be “Stinking Waters.” Every year, thousands of people from all around the world visit Pagosa, and use the Hot Springs for their world-famous mineral benefits. The Ute Indians were one of the first to discover the miraculous Pagosa Hot Springs, thus were able to name them. History tells us that many battles were fought by the Native Americans over the Pagosa Hot Springs. They believed them to have a healing power which was worth dying for, as many did in trying to defend their believed ownership in the Springs. Today, people travel from all over just to sit in the mineral filled Hot Tubs. Here are some of the minerals that make up the amazing healing waters of Pagosa Springs: GO HERE TO READ MORE.